Ken and LeAnn Dixon, Lance Creek, Wyoming, ZumBrunnen Angus bull buyers. 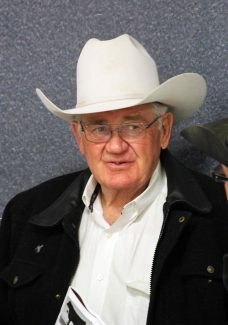 Fred Larson, Douglas, Wyoming, got several bulls at the ZumBrunnen Angus sale. 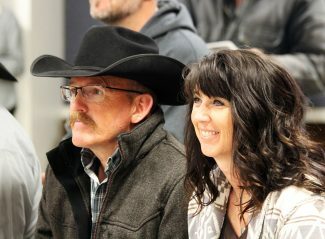 Jason and Shirley along with Mel and Lola ZumBrunnen presented a very nice set of yearling Angus bulls for their annual production sale. The ZumBrunnen family has been in the purebred Angus business since 1948. With Jason taking the reins more the past few years they have implemented an ET program along with extensive AI protocol, advancing the genetics of the cowherd. The top selling bull was lot 3, ZA Freedom G6800, a Sept. 2016, son of BAldridge Bullet B720 with EPDs of: CED 5 BW 2 WW 69 YW 121 Milk 15 selling to Harold Miller, Lance Creek, Wyoming, for $7,000. Lot 20, ZA Combination G7028, a Feb. 2017, son of Connealy Combination 0188 with EPDs of: CED 8 BW -0.2 WW 61 YW 110 Milk 21 sold to Turtle Creek Ranch, Glenrock, Wyoming, for $6,000. Lot 33, ZA Capitalist G7193, a Feb. 2017, son of Connealy Capitalist with weaning ratio of 106 sold to Ken Dixon, Lance Creek, for $5,750. Lot 5, ZA Fortress G7121, a March 2017, son of KCF Bennett Fortress sold to Dennis Horton, Riverton, Wyoming, for $5,350.